The latest Grosvenor tote is ready. It is a simple and elegant tote; its impact comes with its colour. 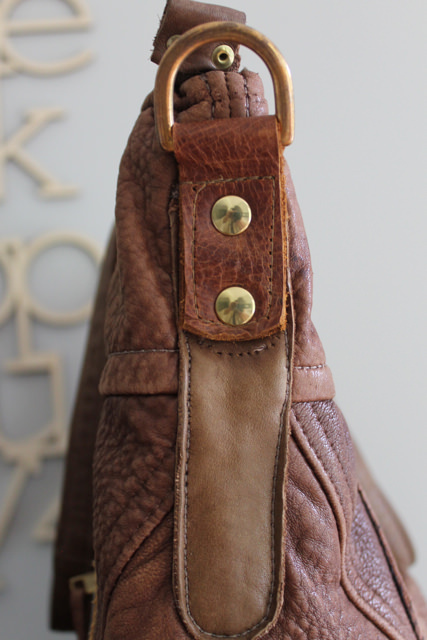 This tote is fully double stitched and has a doubled leather bottom with ‘feet’ to prevent scraping. 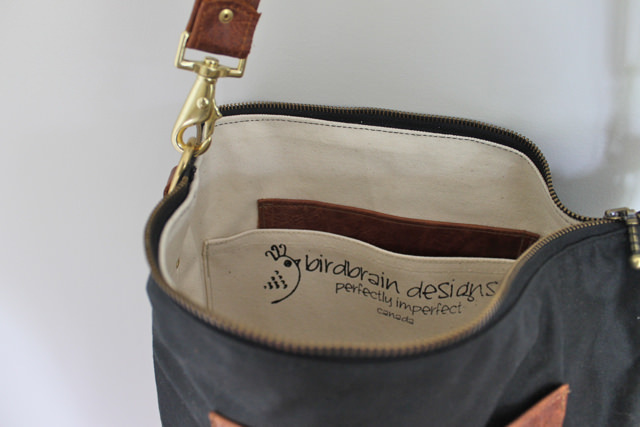 As with all birdbrain travel totes, this has alternatives–double wide carry handles with riveting detail and an adjustable and removable shoulder strap. 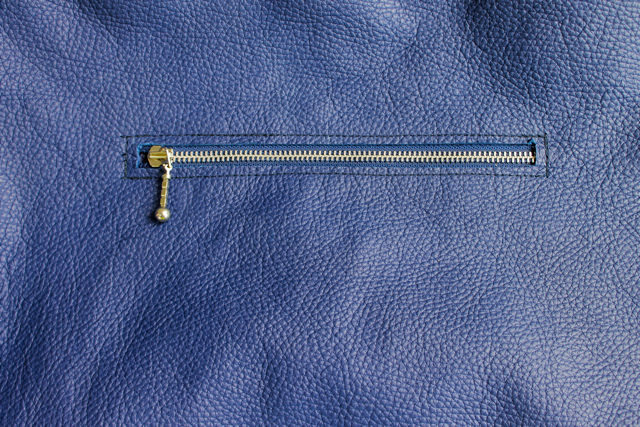 The hardware and zippers are good-quality chrome. Outside it has a large zipper pocket and inside four pockets: two are ipad size, one has a zipper for extra security and one is for your phone. 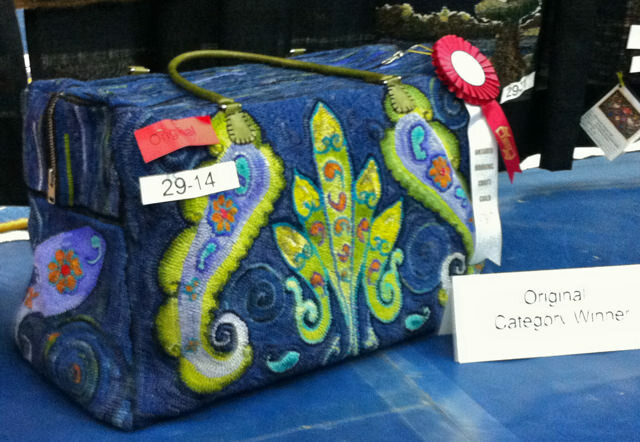 The tote measures 17″wide, 14″ high and 6″ deep. The strap extends to 53″. 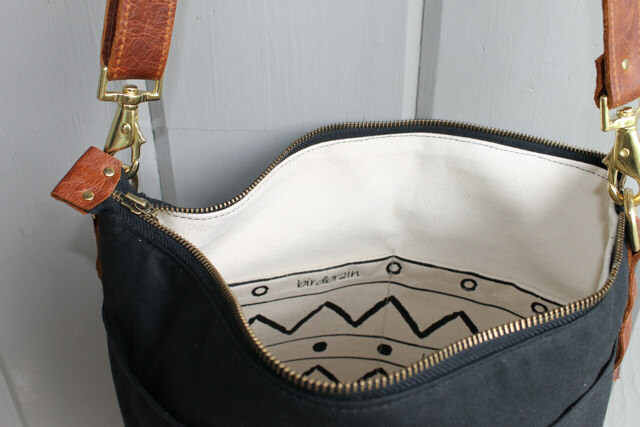 This is a perfect tote for travel as it fits easily under an airplane seat. 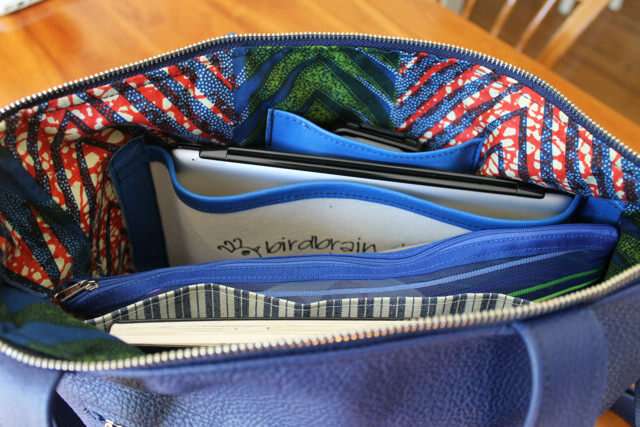 But, that said, many of the Grosvenor totes are in almost daily use with ipad, sketching tools and other essentials. 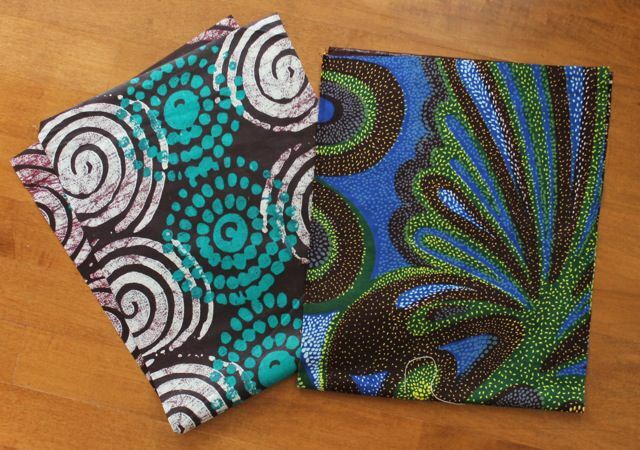 Check here to see the pockets and great African wax print lining. This tote is a special order, but I do have enough leather for one more. If you are interested, let me know. 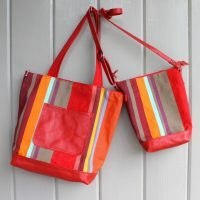 I have been in the studio this week working on a couple of new bags. 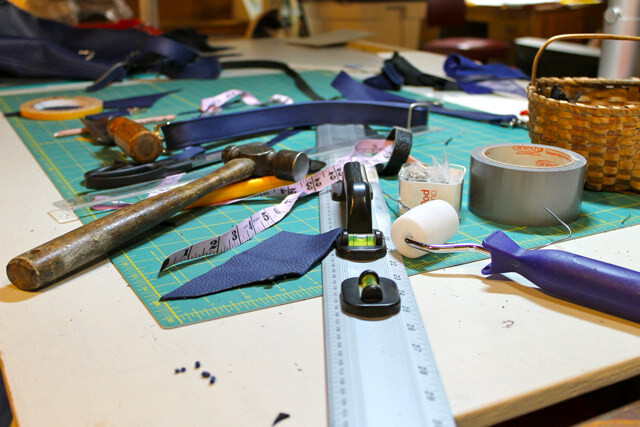 Above is the work table with the blueberry tote in process. 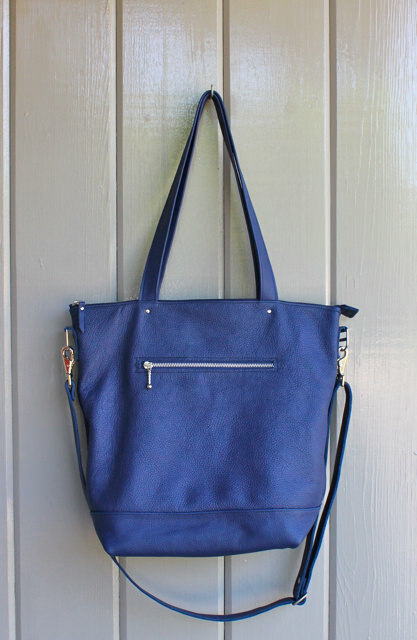 This is the same Grosvenor tote which you have seen here and here, but this time in a rich blueberry pebble leather. 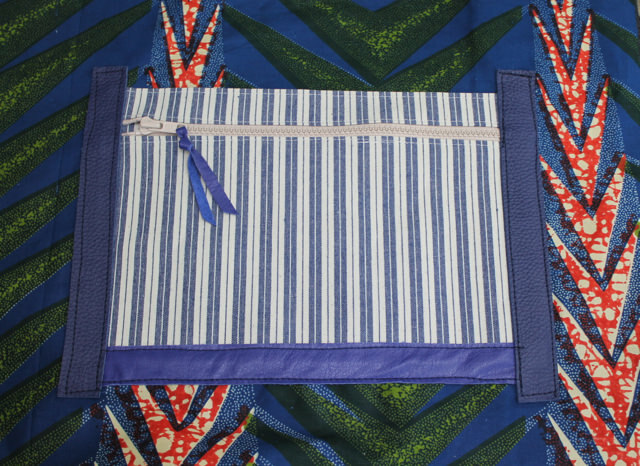 It is lined with a beautiful blue/red/green African wax cotton block print. The new modification comes with the inside pockets, each designed to hold your ipad, and all your other travel stuff you need to keep safe. 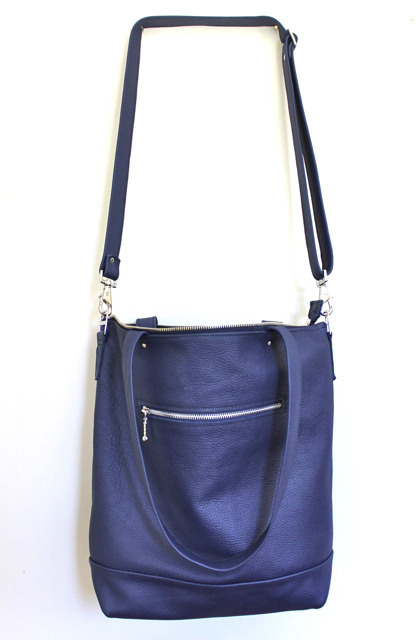 Outside there is a deep zippered pocket, carry handles and a cross-body strap. This is a special order, but I have just enough leather left to make one more. 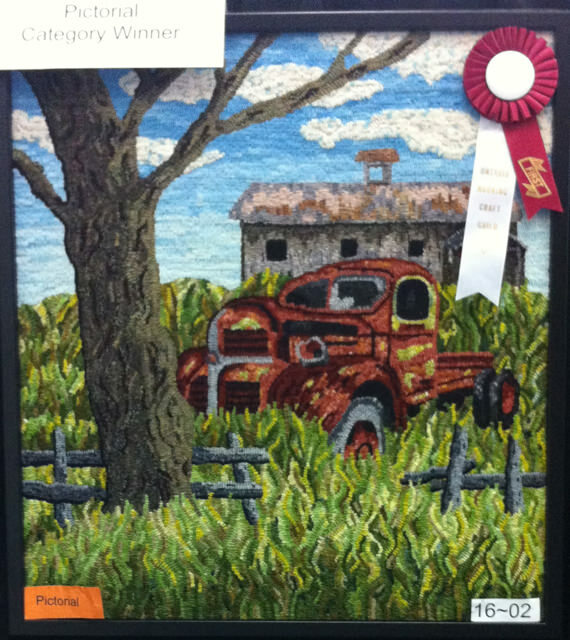 I am just home from the annual meeting of the Ontario rug hooking guild held in Oshawa this weekend and I wanted to share some of the winners of the rug display. There were so many wonderful rugs but, as always, it was hard to do justice to them in photographs. Here are some I managed to take. 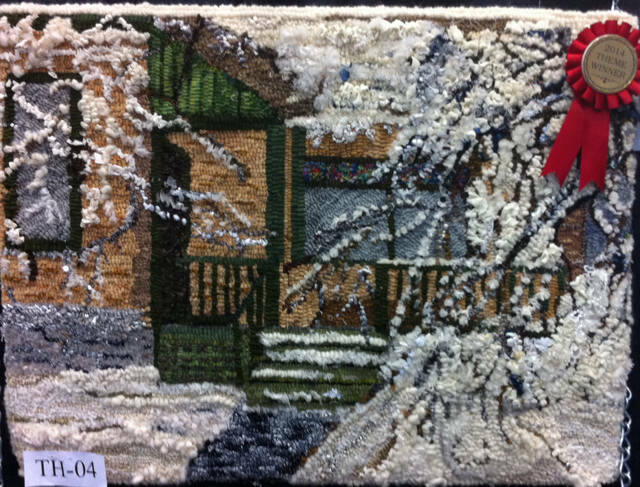 Our local rug hooking group was very proud that Mary Anne Keast’s wonderful piece was the winner in the pictorial category. 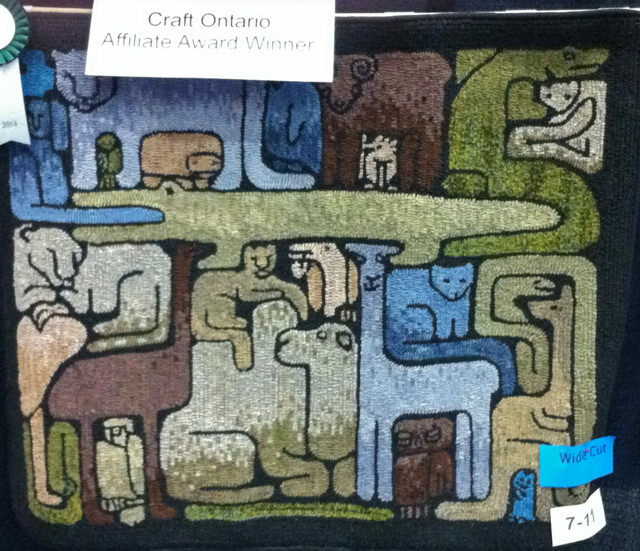 Some of the other winners are pictured below: Barbara Lucas in the Mad About Texture theme category, Pat Lawson in the wide-cut category, Susan Clarke’s carpet bag in the original category and Jocelyn Gordon’s Animal Puzzle won the Craft Ontario Affiliate Award. 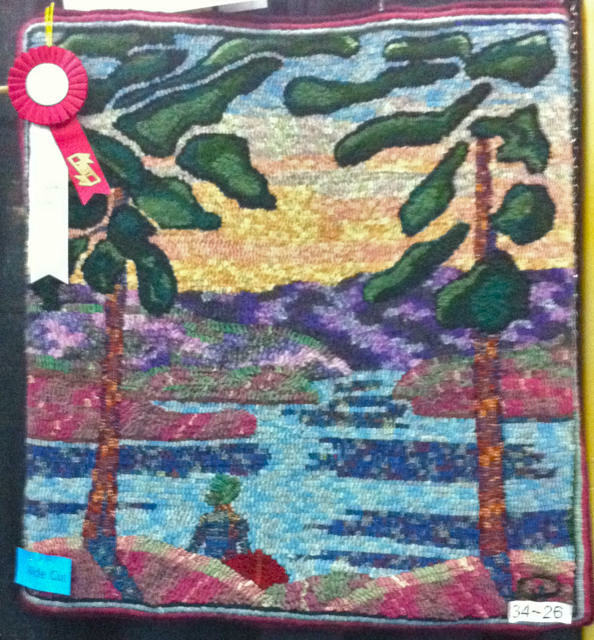 I am leaving this afternoon for our annual Ontario rug hooking conference in Oshawa. I have not been hooking very much this year, so I have only two small submissions, each self-portraits of a kind, and you can see them below. But first I want to share a link from the CBC. I was driving yesterday and I heard this on Michael Enright’s Rewind. The program focuses on a wonderful interview Peter Gzowski did with Chief Justice Beverley McLachlin. But what stopped me in my tracks and what I want to share with you is the very beginning of the program where Justine, a 26 year old medical student, writes a letter to CBC. This small segment captures the magic of the CBC and its importance to all of us. I encourage you to listen. A second link is to an interview with Kaffe Fasset. He takes us through his sketchbooks and his wonderful fabrics. It’s under four minutes–give it a go! And speaking of a life with colour, here’s what I found yesterday at my favourite second hand shop: a wonderful cotton scarf and a polka-dot cotton top. Perfect. The most recent tote is all packaged up and on its way. The new owner tells me it is a birthday present to herself! What a great idea. I’ll be making more of these totes in the coming weeks. I like the combination of waxed canvas and leather with the heavy canoe canvas inside. Next maybe khaki and burgundy. 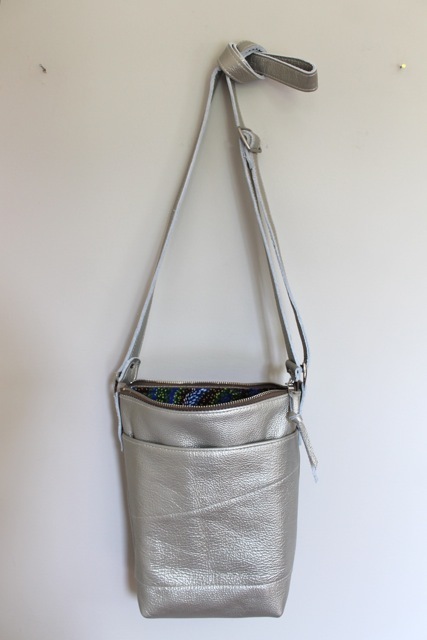 And here is a new Missouri Silver Pebble bag–this one a little wider and taller than the original. I really like this leather. It has a great heft to it and a lovely sheen. And it is a neutral bag without being drab. This one is a special order and there is one more of the same dimensions in the studio, soon to be in the shop. And then there is enough leather left for a Friday pouch. 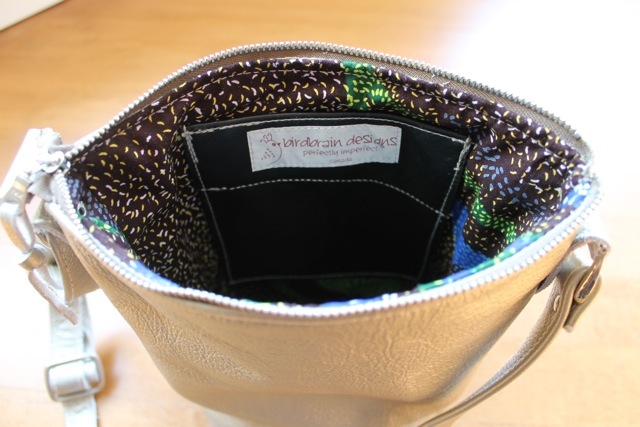 The exterior pocket fastens with a magnetic closure and there is a leather pocket for your phone inside. The cobalt, green and brown wax cotton lining is a nice surprise inside. 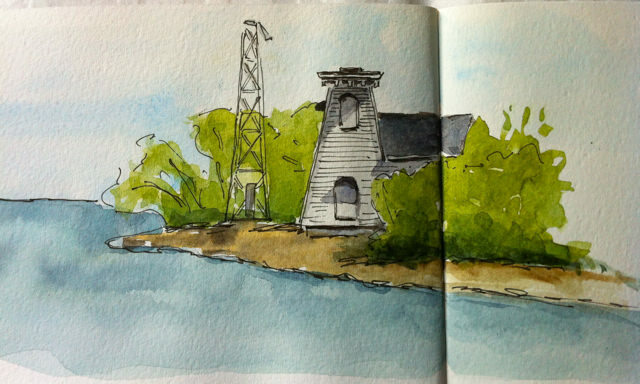 I sat on the shore of Lake Ontario in the welcome sunshine today for this sketch. There was lots of gardening and studio work to be done at home, plus the finishing touches on my Kenya talk, but I loved settling into the calm and relative isolation of the shoreline, a calm interrupted only by birdsong and a flashing glimpse of one lone fox emerging for seconds in the green undergrowth. Wish I could have sketched him! Nonetheless, it was a perfect holiday afternoon. 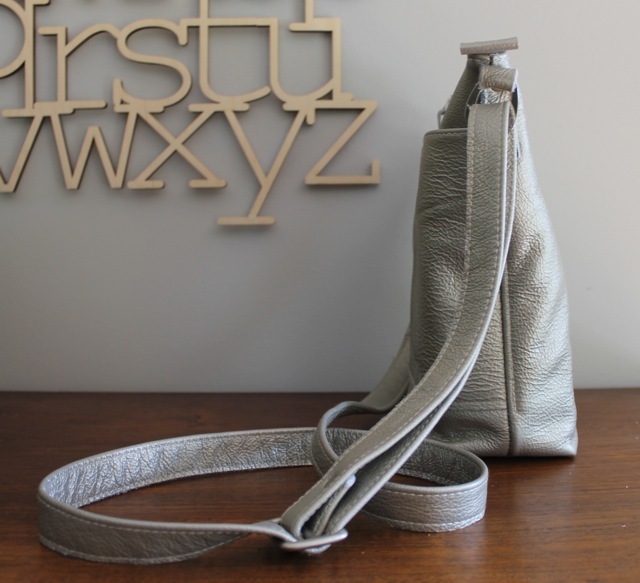 Otherwise I have been working on a couple of small silver pebble shoulder bags, a little bigger than the one in this post. Below is a glimpse of them in process as well as the two pieces of Kenyan wax cotton for the lining. 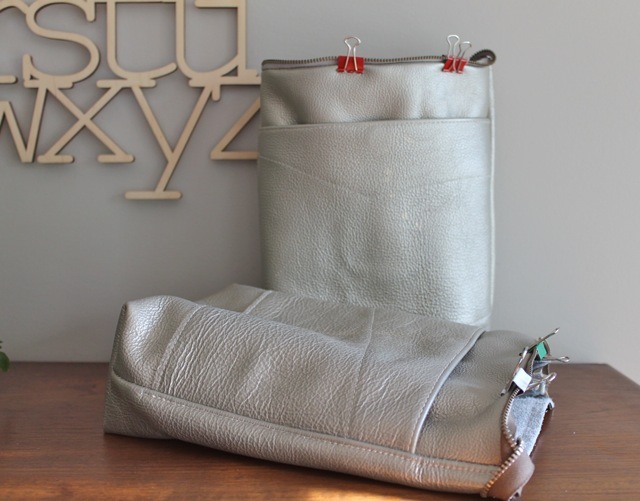 These bags have a large pocket on the outside which has a magnetic closure and a leather phone pocket on the inside. The shoulder straps are on the sewing table now. 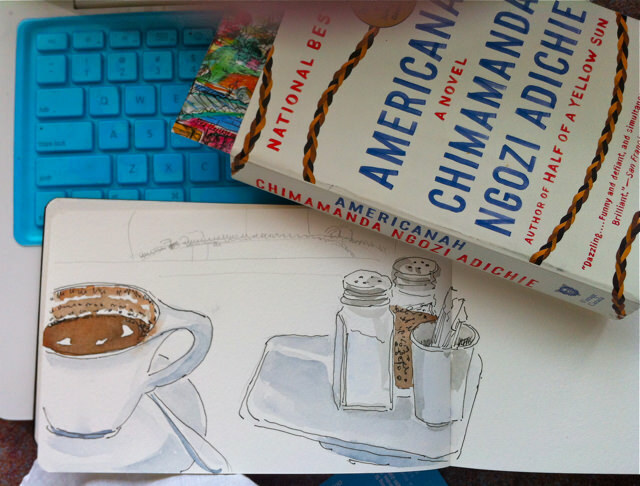 And I am coming to the end of Americanah, a big riveting yet uncomfortable novel and the the best I have read this year. We follow the two main characters from Nigeria to the US and/or Britain and along with their journeys come unsettling questions about race, gender and so many of the easy assumptions we rest on. I’m betting this book will win the Bailey Prize this year. There is a full review here from New York Magazine. 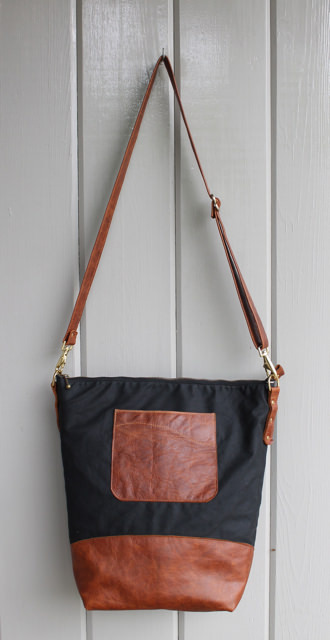 I made a couple of totes in leather and waxed canvas last year and they flew out of the shop. Recently, I was able to get some black antique waxed canvas (with the Eddie Bauer designation still on the bolt), so I wanted to make a few more of these durable totes. 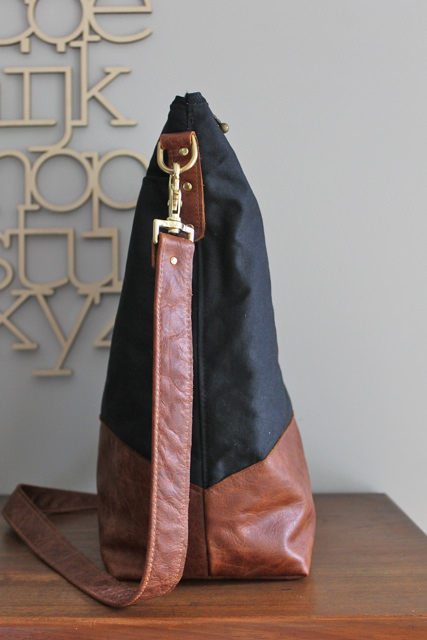 This one is trimmed in caramel leather, has a caramel leather adjustable shoulder strap and is lined in rugged canoe cotton. 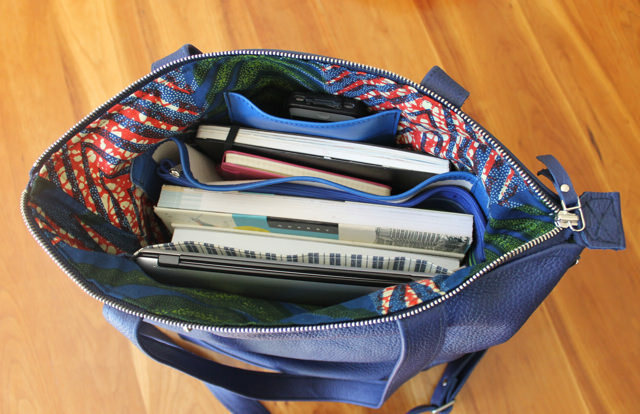 It is large, 15.5″x14″x6″, has three outer pockets and four inside. 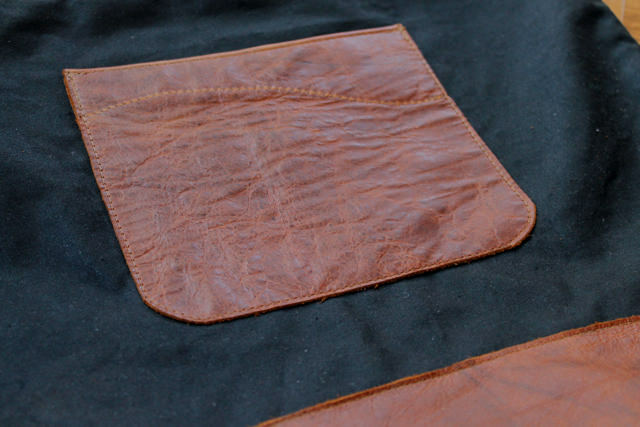 Pictured above is the ipad pocket and a leather pocket tucked in behind. This is a great working or travel tote, or even diaper bag, large enough to carry all you need. You can see this tote in the shop by hitting the on-line store button in the sidebar on the right hand side of the post. Below is Carissa’s well-loved and well-used tote/diaper bag. This bag has been in constant use for a year and a half, crammed full of all the things a baby needs. 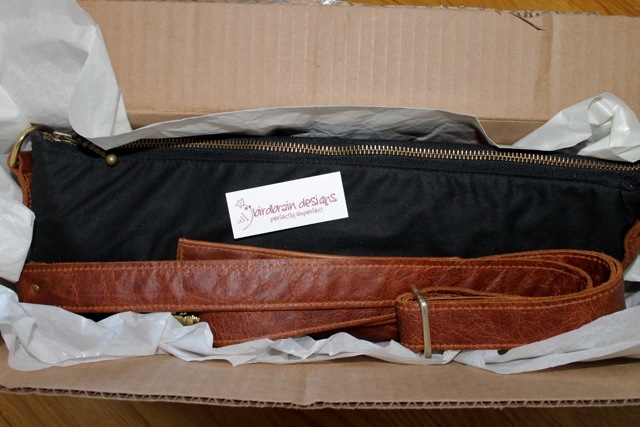 Finally, one of the straps gave away and the bag came in for repair. Pictured below is the repaired strap, ready to be back in full use tomorrow. 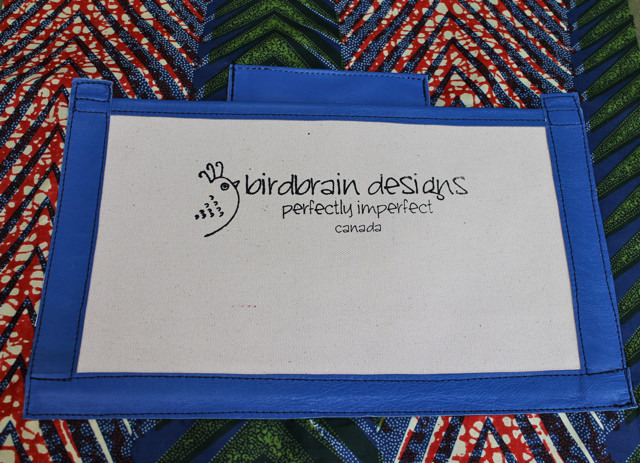 I’m including this, just to remind everyone, that all bags made in the birdbrain shop are guaranteed. After my first time in Kenya, my friends and family organized resources to support a bright young unqualified teacher to help her attend university and the wave continued in that circle to support four students in high school. Education is costly even at the high school level, and studies document the undeniable positive effect of education on the society as a whole. Here is an excerpt from Nicholas Kristoff’s op-ed piece in the New York Times Sunday Review, May 10, 2014. That means that curbing birthrates tends to lead to stability, and that’s where educating girls comes in. You educate a boy, and he’ll have fewer children, but it’s a small effect. You educate a girl, and, on average, she will have a significantly smaller family. One robust Nigeria study managed to tease out correlation from causation and found that for each additional year of primary school, a girl has 0.26 fewer children. So if we want to reduce the youth bulge a decade from now, educate girls today. While the support for education is positive, I am now thinking beyond that. Much more must be done working with the people of Kenya and taking our lead from them. 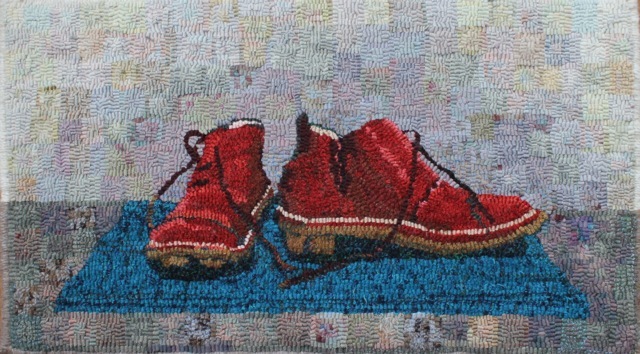 I’ve talked here about the hopeful beginnings of a small cooperative in Matangwe Kenya making hooked rugs. It could be a way for women to earn, to be in charge of their own incomes and to make decisions about how they spend that income. My thinking has changed radically from my first visit when I loaded my suitcase with donations for the school. I realize now that these ‘one-off presents’ are short-lived and encourage the thinking that someone else will solve the problem. The Nigerian protagonist’s comments on charity in Chimamanda Ngozi Adichie’s striking, eye-opening novel, Americanah, (a novel I encourage you to read), clarified a growing discomfort I have had with providing and deciding instead of listening and facilitating. It’s complex to state it mildly. These are some of the questions I am grappling with–I hope with open eyes and ears. My friend MB and I are going on a cycling trip in June, so we thought we better get going on our regime. This past Wednesday we cycled along Lake Ontario from one small town to the next and back again. Spring has finally arrived in Eastern Ontario and it was a perfect day for a ride. Now it was into the wind–but we really were not pushing ourselves too hard– stopped half way to sit on a patio and visit an art gallery where I was lucky enough to find a Kolinsky sable pocket brush which my cousin, John, recommended. 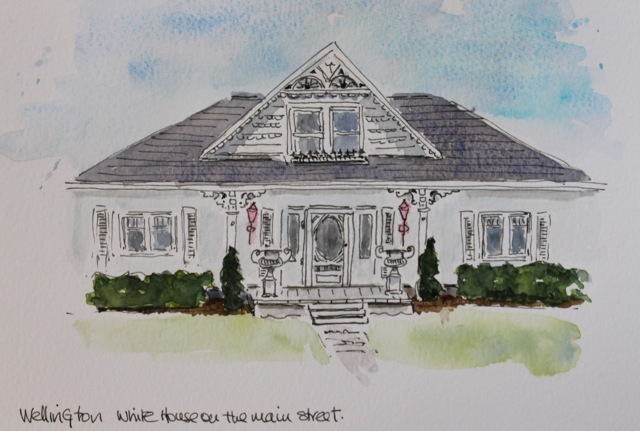 Before the ride, I started this sketch of one of my favourite houses there, (the porch lights are really bright pink) and then added paint with my new brush when I got home. 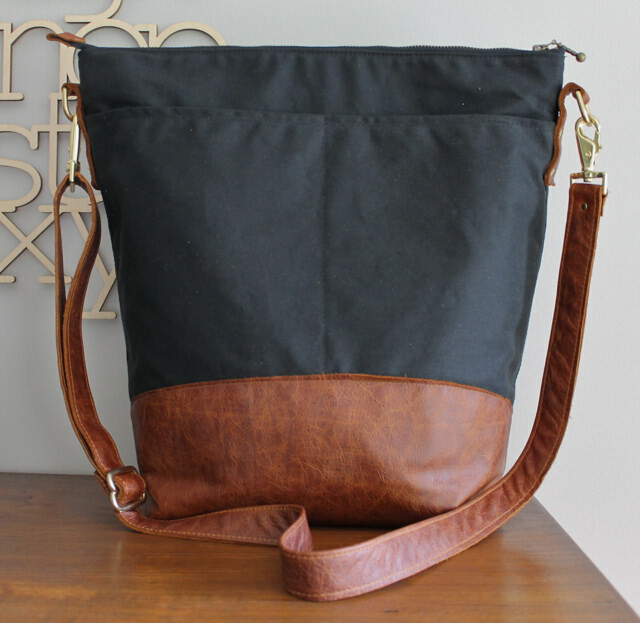 The new tote made of black antique wax canvas and toffee leather is close to finished. It has a large double pocket on the front and a slip pocket pictured here on the back, a leather bottom and adjustable shoulder strap. It is just awaiting its canoe canvas lining which will have lots of compartments for computer, passport etc–and should show up in the shop by the end of the week. 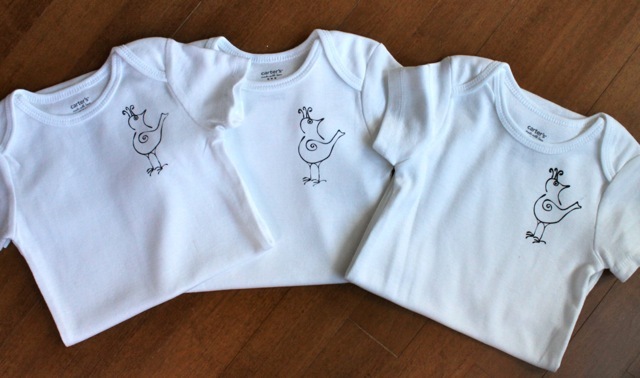 I have been screen printing some baby gifts. Here are a few. I think the Bird with Attitude looks pretty cute on these 12 month old pieces.